It’s been quite a while since I’ve done any kind of book review, but this one warrants a bit of attention because it is—and it isn’t—what I expected. Anymore, I tend to avoid books that belong in the trendy, hip, postmodern category. Been there, done that. I’ve had enough of disenfranchised, “progressive” or Bono-esque Christians who think their calling is to offend, shock, or stretch the limits of theology. 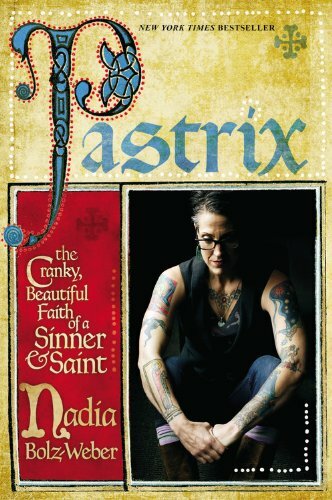 So, when I first heard mention of Pastrix, I thought, “oh, Anne Lamott with tattoos,” and didn’t give the book another thought. Except, that I knew the person who designed the cover, which is totally awesome. I remember sending JuLee a Facebook message that I’d probably buy the book just for the cover. But, I didn’t, at least right away. I have too many “spiritual” books laying around that I’ve never read. But, as weeks went by, I kept seeing Nadia’s name pop up, and then found a video of one of her messages. It was probably one of the most grace-filled sermons I’d heard in a long time. Then I listened to a couple of more of her sermons, and found her to have a very tenacious hold on grace, which I am attracted to. So, I broke down and bought the book. On one hand, it’s not a great book. I mean, she’s not a C.S. Lewis, and you’re not going to be impressed with either her prose or her theological brilliance (I’d say the same thing about my own book). But, Pastrix is not that kind of book. It’s also not a typical autobiography, although it is intensely personal and autobiographical. It’s also not an angry rant against traditional evangelical attitudes, or a treatise on gay rights, or an attempt to change anything. Neither is it an attempt at self-justification, the way so many memoirs are. It is, according to it’s book flap, a spiritual memoir. I would describe it as a confession—of a sinner who is being saved by grace, an admitted misanthrope who was called to pastor “her people” as well as a bunch of people she couldn’t relate to at all. The book is filled with her past and present failings, and her constant discovery that grace is both challenging and essential, and that life is a process of death and resurrection. There are a number of things in the book that many of what I refer to as “shiny, happy people” Christians will find shocking. Nadia swears like a sailor, has a very colorful past, and uses a few colorful phrases that I don’t even understand. She doesn’t edit her language for the book. At first, you might think the “f” word is inserted throughout the text on purpose, and in spite of the fact that I believe this is her “native” language, it does seem at times self-aware. But, some of that is possibly due to an editor striving to find a balance between honesty and readability. But that’s not what I think is shocking. There are also a number of stories about a number of people who fall into the “non-straight” categories, and the fact that Nadia’s church, the House for All Sinners and Saints, is, according to their website, “queer-inclusive.” But that also is not the most shocking thing in the book. What is perhaps the most shocking thing is that Bolz-Weber is, of all things, a Lutheran. I mean, when’s the last time a Lutheran had a best-selling Christian book? And who would expect a tattooed, foul-mouthed ex-comedian to have such a respect for the Eucharist or baptism or the Liturgical Calendar? She is, at the same time, both liberal and traditional. One of the things that struck me was her talking about following the Lectionary, which is essentially a preaching schedule that prescribes what texts to preach from on any given Sunday. She expresses concern about what would happen should she ever stray from this schedule, and allow herself to preach on any topic she wishes, as well as her concern to stay true to the text. I could only wish that evangelical pastors could follow this example. It is clear that she does not take her role as pastor lightly, and if anything, is something of a reluctant pastor, knowing that she, on her own, is inadequate. I imagine, for some evangelicals, the fact that she’s Lutheran will just confirm the fact that she’s not really a Christian (believe me, I’ve heard some wacko stuff through the years, being of Lutheran extraction myself). But, she understands the gospel, and it comes through time and again. Perhaps, being someone who has admittedly been “forgiven much,” she has a much batter grasp on grace than some of us. It’s no coincidence that she has a tattoo of Mary Magdalene on her arm. I expected the book to have a certain amount of self-righteousness due her church’s acceptance of sinners of all stripes, because these kind of books often do. But, there is none of that to be found. Bolz-Weber owns up to her self-righteous tendencies, and calls sin sin, taking an extremely humble attitude, and constantly looks to Jesus as savior, healer and redeemer. I found myself having to admit that at times, my own belief in grace fell somewhat short, and I was challenged to reexamine myself. But, it’s an interesting book in that it never lets you walk away feeling anything less than loved, forgiven, and in the process of being saved. The message of the book is not to build up Nadia Bolz-Weber in any way. Where some authors take the “this is just who I am” approach to justify who they are, Bolz-Weber never falls into that trap. She knows she is inadequate, so clings strongly to the Cross and the Empty Tomb. The message that comes through loud and clear is that the Gospel is dangerous, that it will confront you and change you. That, in the words of another friend of mine, the Gospel accepts you as you are, but it won’t let you stay the way you are. As I mentioned in a previous post, I am challenging myself to reexamine some things, and this book was quite helpful in that regard, as it identified and challenged the “boundaries” of grace. This personal challenge, by the way, is not a response to current events or issues, but from actually reading the Gospels. As I’ve stated in the past, when I read the Gospels as a whole, rather than in bite-size chunks, I tend to come away more “liberal,” with a much bigger picture of grace. I noticed, for one thing, that when Jesus says,”Go and sin no more,” he doesn’t identify which sin. I try never to be presumptuous in interpreting Scripture, but it’s funny how easily we fill in certain blanks. I don’t want to give the impression that I agree with everything in the book. She makes some statements that make me go, “Now, hold on a minute…” I’m guessing everyone could find at least one of those in the book, and some people obviously more than others. But, why bother to read a book that you already agree with? That’s kind of a waste of time. Pastrix, perhaps, is not a book for everyone. I can think of many people I wouldn’t give the book to, for a number of reasons. But, if you think you understand grace—or want to—and dare to be challenged, this may be a great book for you. Click here to read or listen to some of her sermons. This entry was posted on Monday, January 13th, 2014 at 9:43 amand is filed under . You can follow any responses to this entry through the RSS 2.0 feed. You can leave a response, or trackback from your own site.